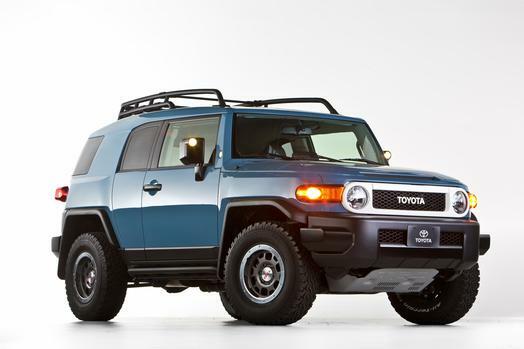 What’s New for the 2013 Toyota FJ Cruiser? The 2013 Toyota FJ Cruiser remains virtually unchanged, with the exception of a new Trail Teams off-road special edition package. The 2013 Toyota FJ Cruiser’s exterior is as exciting and unique as ever. It offers two full-sized, and two half-sized doors to allow relatively easy access to the back seats. High ground clearance make off-roading not just a possibility, but a necessity. The FJ Cruiser is instantly recognizable, with its round headlights and wide grille, and two-tone paint in a variety of available colors. If you look at a 2013 FJ Cruiser and can’t muster up a smile, there’s truly no hope for you. The FJ Cruiser’s 4.0-liter V6 engine pumps out a powerful 260 horsepower and 271 pound-feet of torque. This motor, which is standard on all 2013 FJ Cruisers, is paired to a five-speed automatic transmission, and comes with rear-wheel drive and limited-slip differential. Serious off-roaders can opt for one of two four-wheel drive options—a part-time system similar to the rear-wheel model, and a full-time system that comes with a six-speed manual gearbox. One downfall of the 2013 Toyota FJ Cruiser is its fuel efficiency. As a true SUV, the FJ Cruiser falls short of the impressive fuel economy offered by many crossovers, but its efficiency is comparable to other SUVs in its segment. The rear-wheel drive model returns 16 mpg city, 20 highway, and 18 combined; while the four-wheel drive versions come off a little worse, with the automatic offering 17/20/18, and the manual 15/18/16. One of the first things you’ll notice inside the 2013 Toyota FJ Cruiser is its roomy front seats. Unfortunately, this spaciousness doesn’t extend to the back. Rear-seat passengers will likely become quite uncomfortable on longer journeys, so the FJ is better saved for short trips, or for drivers who only carry one passenger regularly. Standard features include air conditioning, water-resistant cloth upholstery, Bluetooth phone and audio connectivity, and a six-speaker sound system with CD player and satellite radio. Options include a rearview camera, auto-dimming rearview mirror, and a leather-wrapped steering wheel. Safety is an important part of any vehicle, especially if you plan on taking it off-road. The 2013 Toyota FJ Cruiser offers standard safety features such as front-seat side airbags, side curtain airbags, antilock disc brakes, and traction and stability control. Government crash tests gave the FJ Cruiser the highest possible rating of “Good” for its performance in the frontal-offset and side-impact tests, and second-best “Acceptable” for its performance in the roof strength test.